The Drawing layer is at the core of a scene's structure. A drawing layer is linked to an element, which contains a series of drawing, and its Xsheet column, which indicates when and for how long each drawing is exposed. The layer is what connects the element and its exposure to the rendered image. It indicates the position of the drawings relative to other elements and to the stage, as well as the drawing's connections with pegs, groups and effects, if any. Although drawing layers can be transformed and animated on their own, it is typical to connect them under a parent peg. This allows you to keep the position and animation information of the element in the peg, making it easier to manipulate the exposure and the transformations separately. This is especially useful in digital cut-out animation where manipulating and transforming layers is often the main method of simulating movement, and changing drawings is the secondary method. You can also connect a drawing layer as a child of another drawing layer. Just like with pegs, any transformation done to the parent layer, whether on itself or through one of its parents, will also be applied to the child layer. Optionally, you can connect a matte drawing to a drawing layer. When a drawing layer has a matte drawing, only the parts of the drawings that intersect with the opaque areas of the matte drawing will be rendered. This allows you to accomplish the same effect as connecting the drawing layer to a cutter effect. 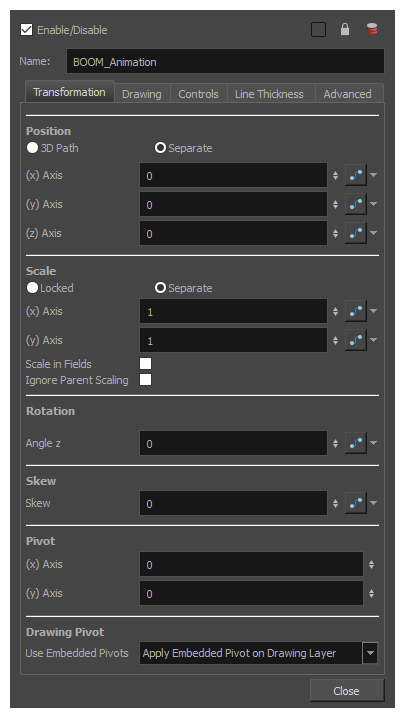 The Transformation tab contains parameters for adjusting the position, scale, rotation, skew and pivots of an element. Scale in Fields: With this option enabled, the scale factor is based on the amount of fields in the scene. For example, to shrink one of the dimensions of an element to half its original size, the scale factor would normally bet set to 0.5. If this option is enabled and the amount of fields in the scene is 12, then the scale factor to shrink the element by half would be 6. Ignore Parent Scaling: When this option is enabled, scaling factors applied to a parent layer will not be applied to the current layer. This can be handy in cut-out rigs when you need to scale an arm without affecting the forearm. Angle z: The angle at which the element is rotated, based on the 360 degrees scale. Values below 0 or above 360 degrees will cause the rotation to cycle. Skew: The angle at which the element is skewed. This value can range from -90 to 90 degrees. 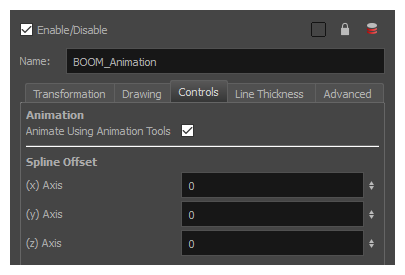 NOTEThese parameters can be changed visually by clicking and dragging the pivot point when using on of the tools in the Advanced Animation toolbar. The pivot of the element, which is set by the Pivot parameters above. The pivot of the currently exposed drawing, which is set using the Drawing Pivot tool. Don't Use Embedded Pivot: Ignores the pivot point of the exposed drawing. The pivot point of the element is positioned using the Pivot parameters above, relative to the centre of the drawing. Apply Embedded Pivot on Parent Peg: Use the pivot point of the exposed drawing to determine the position of the pivot point of the parent peg of the drawing layer. This is useful when making a character rig where each element has a parent peg, and those parent pegs are intended to be used for animation. The pivot point of these parent pegs will be based on the pivot point set for the exposed drawing. Apply Embedded Pivot on Drawing Layer: Use the pivot point of the drawing to determine the pivot point of the element. This means the pivot point is positioned using the Pivot parameters above, but relative to the pivot point of the drawing. The two latter options are useful when making a character rig where a layer can represent a body part from different angles. Since each angle is represented by a drawing, and each angle is liable to have a different pivot point, you can set the pivot point of each angle by using the Drawing Pivot tool on each drawing. Then, if you want to animate the drawing layers directly, you can set this parameter to the Apply Embedded Pivot on Drawing Layer option, and if you want to animate using the parent pegs of the drawing layers, you can set this parameter to the Apply Embedded Pivot on Parent Peg option, so that these pivots are used when animating the different parts of the rigs. 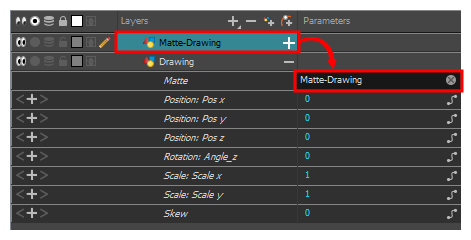 The Drawing tab contains parameters for the art layers, bitmap images and the element's matte drawing. Drawing Path: Displays the full path to the current drawing. 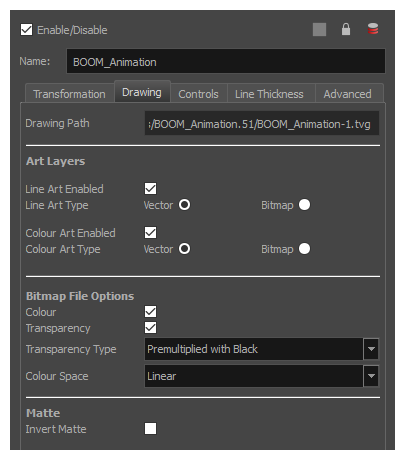 These parameters allow you to set whether each art layer in the drawing layer is enabled, and whether they should contain vector or bitmap artwork. By default, options for the Line Art and Colour Art layers will be available. If the Enable Overlay and Underlay Arts preference is enabled, options for the Overlay Art and Underlay Art layers will also be available. Enabled: Determines whether the art layer is displayed. Vector: Makes the art layer enabled for vector artwork, Vector drawing tools will be used to draw in this art layer, and vector artwork information will be preserved. Bitmap: Makes the art layer enabled for bitmap artwork. Only bitmap-compatible drawing tools will be enabled when drawing on this layer, and all artwork will be rasterized into a bitmap image. Colour: Determines whether or not the colours in the image is processed. If unchecked, the image will be solid black. Transparency: Determines whether or not the transparency in the image is processed. If unchecked, the image will be fully opaque. Transparency Type: If the layer contains bitmap images with a transparency channel, there are several approaches to rendering the image's transparency. You may need to select the proper transparency type to make sure Harmony renders the image as intended. Premultiplied with Black: Semi-transparent pixels in the original image are blended with black. Premultiplied with White: Semi-transparent pixels in the original image are blended with white. Straight: Semi-transparent pixels in the original image are left as is (unmatted). Clamp Colour to Alpha: Semi-transparent pixels in the original image are blended with black. On import, each of the RGB channels is clamped so that a color value never exceed the alpha value for a given pixel. When the RGB values are multiplied with the alpha value, that is to say, if you have a pixel of value R=247, G=188, B=29 and the alpha is 50% or the image has a 50% transparency, then the actual RGB values output would be half of the amounts listed above. Colour Space: If the element is displaying original bitmap files that are not tagged with their colour space information, this allows you to set the colour space in which Harmony should render the image. Linear: The default value. The linear colour space is one where the intensity of each primary is directly proportional to their value. Typically, visuals are rendered in a linear colour space until the final compositing stage. sRGB: The most common colour space used with computer and digital device displays. With this colour space, the relation between the value of each primary and their intensity is defined by a gamma function. Rec.709: A colour space commonly used for HD television. It is very similar to sRGB with a slightly lower gamma curve. Matte Invert Matte: If a drawing, group or effect is added to the drawing's Matte attribute, the part of the drawing that intersect with the matte's opaque areas will be cut out by default. If this parameter is enabled, the part of the drawing that intersect with the matte's transparent areas will be cut out instead. The Controls tab contains animation control options. Animate Using Animation Tools: By default, a drawing layer can be animated directly, as if it was its own peg. If you disable this option, it will only be possible to animate the layer using its parent peg. If the layer has no parent peg, it will be immutable. This can be useful if you want to create cut-out character rigs that should only be animated using pegs, which can help separate the drawing exposure from the transformations on the drawings. If every drawing layer in a character rig has this option disabled, only layers that have a parent peg will be animatable, and the animator will only be able to animate on the pegs. This also rules out the possibility of accidentally animating an element directly and using its parent peg concurrently. When this option is disabled, clicking on the drawing layer in the Camera view with the Transform tool will automatically select the layer's parent peg. If the layer's controls are displayed, you can see its animation trajectory in the Camera view. This is referred to as the spline. By default, the position of each point in the spline is based on the element's pivot point. However, you can use the spline offset to give it a more fitting position if desired. You can do this by using the Spline Offset tool of the Advanced Animation toolbar, or by manually entering the offset values in the Spline Offset fields. (x) Axis: The horizontal offset of the spline, in fields. (y) Axis: The vertical offset of the spline, in fields. (z) Axis: The depth offset of the spline, in fields. In the Camera toolbar, click on Show Control . Press Shift + F11 (Windows/Linux) or ⌘ + F11 (macOS). The Line Thickness tab contains options regarding the way pencil lines in the element are rendered. These options can be very useful to enhance the quality of line art without having to work on it. Adjust Pencil Lines Thickness: Enables the options below to adjust the line thickness in the rendered image. Enabled: The line thickness settings are applied to pencil lines in all art layers in the element. This setting should be used if you want to adjust the line thickness of pencil lines. Disabled: The line thickness settings are applied to all art, whether brush strokes or pencil lines, in the line art layer, so that it fits the desired thickness pattern around art in the colour art layer. This setting should be used for drawings that have their line art on the line art layer and their colour art on the colour art layer, which is typical of traditional and paperless animation productions. NOTEWhen this option is disabled, all artwork in the line art layer that does not surround artwork in the colour art layer will be cropped out. Zoom Independent Thickness: Makes the thickness of pencil lines remain unchanged when the camera zooms in or zooms out. Proportional: The factor by which to adjust line thickness. The original line thickness in the drawing will be multiplied by this value. A value between 0 and 1 can be used to make pencil lines thinner. Constant: The offset by which to adjust line thickness. This value will be added to the original line thickness in the drawing. A negative number can be entered to make pencil lines thinner. Minimum: The minimum pencil line thickness allowed. Line thickness will not go below this value. Maximum: The maximum pencil line thickness allowed. Line thickness will not go above this value. Set it to 0 to disable maximum line thickness. Pencil Lines Quality: The quality of the rendered pencil lines when deformed by deformation chains. Increasing this parameter is unlikely to wield noticeable result unless rendering in very high resolutions. 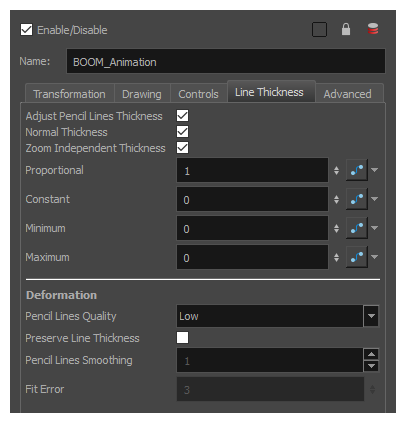 Preserve Line Thickness: If this option is checked, the thickness of pencil lines will not be affected by deformations. Only their directions will be affected. Also, if a pencil line is textured, it will not be stretched or squashed by deformations. NOTEThis setting must be enabled for the Pencil Lines Smoothing and Fit Error parameters to be available. Pencil Lines Smoothing: The smoothing factor applied to pencil lines when rendering. This value can range from 0 to 10. The higher it is, the more corners and points will appear smoothed out. Fit Error: When this parameter is increased, pencil lines in the rendered image will have less vector points and the curves between the remaining vector points will be adjusted to fit the original shape. This setting can be increased if the amount of details and points in the pencil lines creates problems around deformation articulations and corners. Its value can range from 1 to 100. NOTEThe Fit Error parameter will have no effect if the Pencil Lines Smoothing parameter is set to 0. 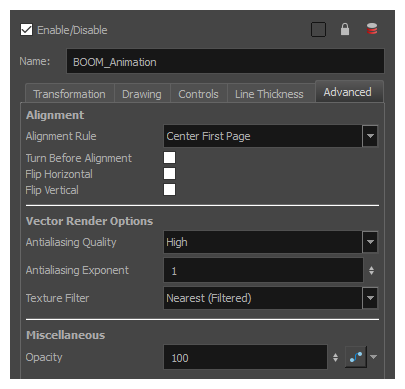 The Advanced tab contains options for setting the alignment of drawings, line thickness, vector render options, and more. Alignment Rule: The alignment rule selections are intended to deal with drawings that were created on paper of a different size or orientation from the default alignment rule (set up in the Scene Settings dialog box) or imported bitmap images. The drawings are then scaled to match the Harmony alignment rectangle. Note that alignment rules are not based on the camera frame, but on the scene frame. Refer to the Fundamentals Guide to learn more about scene alignment and scene settings. Left: The default alignment for drawings; aligns the drawings to the left side of the scene’s alignment rectangle. Harmony scales the drawings to match their height to the alignment rectangle of the scene. Right: Aligns the drawings to the right side of the alignment rectangle. Harmony scales the drawings to match their height to the height of the alignment rectangle of the scene. Top: Aligns the drawings to the top of the alignment rectangle. Harmony scales the drawings to match their widths to the width of the alignment rectangle of the scene. Bottom: Aligns the drawings to the bottom of the alignment rectangle. Harmony scales the drawings to match their widths to the width of the alignment rectangle of the scene. Centre Fit: Centers the drawings. Centre Fill: Centers the drawings and then scales them so the width or height fills the available space. Centre LR: Aligns the drawings in the left-right centre of the alignment rectangle. Harmony scales the drawings to match their height to the height of the alignment rectangle of the scene. Centre TB: Aligns the drawings in the top-bottom centre of the alignment rectangle. Harmony scales the drawings to match their widths to the width of the alignment rectangle of the scene. Stretch: Scales the drawings so they fit within the alignment rectangle of the scene. This is particularly useful for images that you will manipulate with a Quadmap node. If the drawings in the Quadmap node do not have the same aspect ratio as the alignment rectangle of the scene (from the Scene Settings dialog box), the handles on the quadmap will not appear on the corners of the image, making it difficult to manipulate the quadmap. In this case, you would set the drawing layer of the quadmap images to Stretch to make the handles appear on the corner of the image. This can have the effect of distorting the images, but it is not an issue with images that will be distorted through the Quadmap node anyways. As Is: Leaves the drawings aligned as they are. Centre First Page: Aligns the centre of the first part of a standard pan cel with the centre of the field chart. Turn Before Alignment: Rotates the drawings in the selected element 90 degrees to the left before scaling and aligning them according to the alignment rule, and before performing any offset, rotation or scaling for the element or peg. 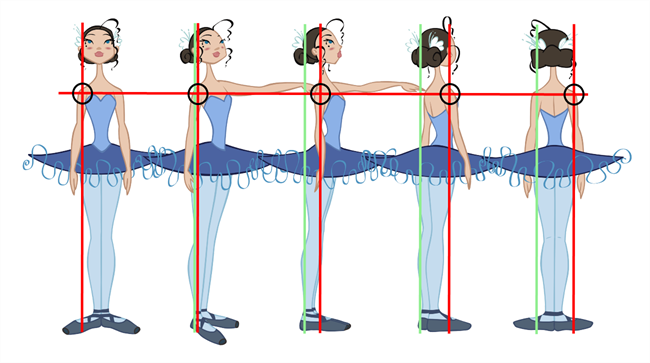 This and the Alignment Rule are intended for drawings that were created on paper of a different size or orientation than the other paper in the scene, and requires alignment so they are treated accurately. Flip Horizontal: Flips the drawing on the horizontal axis. Flip Vertical: Flips the drawing on the vertical axis. Antialiasing Quality: The smoothness (antialiasing) setting used to make the crisp vector contours appear smooth. None - No Transparency: Dsables antialiasing, renders semi-transparent pixels either fully opaque or fully transparent, and fills single-pixel gaps with an opaque pixel to avoid generating out-of-place gaps when lines intersect each other. Low: Disables antialiasing, but renders transparency. Medium Low: Renders vector artwork with basic antialiasing. Medium: Renders vector shapes with improved antialiasing. Bitmap texture fills will appear blurred. High: Renders vector shapes with improved antialiasing, without blurring bitmap texture fills. TIPIt is recommended to leave this setting to High unless you are working on a pencil test, or another type of scene where rendering speed is more important than rendering quality. TIPIf the production requires exporting line art without antialiasing to colour them in a third-party software, it is recommended to use the None - No Transparency setting. This setting automatically fills one-pixel gaps created by crisp lines intersecting each other, which would otherwise need to be filled manually in the third-party software. Antialiasing Exponent: Determines how much the artwork is scaled up to apply antialiasing onto it. A higher value will results in sharper edges, and a lower value will result in softer edges. Typical values range between 0 and 3. Higher values may be attempted but may result in overly crisp outlines. Negative values will cause the outlines to appear blurry. Bilinear: This option takes the four pixels around each point and makes a bilinear interpolation between them, which may make them look blurry. Nearest: When sampling the texture up, this option generates extra pixels by using the colour of the nearest defined pixel. When sampling the texture down, this option simply removes pixels from the texture. Nearest (Filtered): This option is similar to Nearest, but it adds an extra layer of resampling to make all pixels look like they are the same size. Opacity: Lets you quickly change the transparency of the selected element. Opacity settings here will be reflected in both OpenGL preview, and full render.